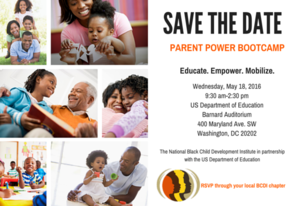 On Wednesday, May 18, 2016, the U. S. Department of Education (ED) in partnership with the National Black Child Development Institute (NBCDI) will host a Parent Power Bootcamp at ED’s headquarters in Washington, D.C. This one-day convening of parents and caregivers is designed to equip participants with information to empower them as advocates for their children’s education. During the Parent Power Bootcamp participants will discuss topics which include accountability, assessments, standards, Title I, and funding resources. For more information please contact Georgia S. Thompson, Director of Affiliate Network and Training Institute at the National Black Child Development Institute at gthompson@nbcdi.org or call 202-640-6550. Next Shouldn’t We All Go Home Before 4?